Have you ever seen someone knock back a shot of melted butter? I have. It was at Red Lobster (home of some cheese biscuits that'll make ya want to skip the rest of the meal), and it was repulsive. Don't get me wrong--I enjoy butter as much as the next gal, but witnessing that scene made me squirm in my seat. On a semi-related note, I was recently reminded of one of my favorite candies when I was growing up--butter rum lifesavers. I really loved their rich flavor. I can recall hearing about a beverage called hot buttered rum and because I want to know everything, I looked up its description. Imagine my surprise (and initial disgust) when I learned that it’s made by beating together butter, brown sugar, and spices and melting this mixture into a combination of rum and hot water. To my mind, that doesn’t sound like a very far cry from taking down a shot of melted butter. Have any of you had hot buttered rum? Is it not as nauseating as I think? I was recently given a little bottle of butter rum flavoring, and I decided to try it out in some mega-muffins. Would they taste wonderful like those lovely little lifesavers, or would they turn my tummy inside out and upside down like a dose of tepid fat? Good news--they’re delicious. The flavor is subtle, but not too understated that you don’t immediately think buttah upon taking a bite. The moral of this post? For once I actually like an artificial flavor much, much more than the real thing. Yes, when it comes to butter rum, I think I’ll stick with candy and baked goods and leave the cocktails (and shots o’ pure fat) to the more psychotic daring among us. Preheat oven to 375 degrees F. Grease or line 12 regular muffin cups or 6 mega-muffin cups. Beat the butter with an electric mixer until creamy. Add the sugar and beat well. Add the eggs one at a time, beating just until blended after each addition. Combine the flour, baking powder, salt, cloves and cinnamon in a separate bowl. In a third bowl, combine the milk and butter rum flavoring. Add the flour mixture to the butter mixture alternately with milk mixture, ending with flour mixture and combining only until JUST blended. Spoon the batter into the prepared pan, filling 3/4 full. Bake for 20-25 minutes for regular muffins (or 30-35 minutes for mega-muffins) or until golden. Remove from the pans immediately and cool on a wire rack. For the glaze, combine 1/4 teaspoon butter rum flavoring and 3 tablespoons of sugar in a small saucepan; heat slowly, stirring constantly until the sugar dissolves. If the mixture gets too thick, add a little milk. Brush the glaze over warm muffins and sprinkle with coarse sugar for a tasty finish. Ugh, my 2 year old has taken a bite out of a block of butter on more than one occasion. And each time he talks about how good it is. Bleh. The muffins look awesome! I love the sugary top. My sister used to eat spoonfuls of Crisco! Anyway, glad these turned out tasting like the butter rum lifesavers- they were my favorite too! How ironic - I was just watching on TV last night as one guy dared another to take a shot of popcorn butter. The other guy refused, so the first guy did it himself, only to find out it was butter-flavored cooking oil. Eew. Ha ha, my kids fight for the little pats of butter we get served at cafes. The winner then eats it straigth up! I think I can volunteer them to try out that drink (I'm with you, it sounds way queasy-inducing). Your mufins on the other hand, look absolutely gorgeous. So golden and crumbly. I haven't thought of those Butter Rum lifesavers in years! They were my favorites, also. It was tradition that we always got one of those lifesaver books for Christmas. You know, the ones that had four or five packs of lifesavers on each side. I always attacked the Butter Rum ones first. The muffins look great!I've gotta bookmark this recipe to make sometimes in the near future. I do like butter and rum, but I've never worked up the courage try to a hot buttered rum. These muffins look like a great alternative! Those muffins sound terrific but the idea of drinking a shot of butter is just gross! Pretty muffins! They must taste really good! Wow, that sounds gross - both the shot of butter and the butter rum drink. Your muffins, on the other hand, do not sound gross at all! I loved those lifesavers as well, and these muffins, mixed with that cinnamon, must be great. Grace, this is one awesome muffin ~ moist and delicious! And thanks for the wonderful memory of Butter-rum Lifesavers... I always liked those the best. I loved those those little rum candies when I was a kid! I used to have a rum cake recipe that used rum flavoring(I must find that now), and it was so moist and delish. I'm not sure I should be looking at this post before breakfast. A shot of butter just doesn't cut it....wink. But these mega muffuns do. Oh no no no...hot buttered rum is nothing like downing a shot of butter. It's more like a very adult version of the lifesavers you (and I) loved as children. My nana always had a pack in her purse! The only time I wanna eat a puddle of butter is when it's in the middle of my mashed potatoes or a buttermilk biscuit, and even then I have to smush it around. Gotta agree on the ick factor of hot buttered rum. The muffins sure are pretty though! I don't want to drink any melted butter or any buttered rum, but I WOULD like to eat one of those gorgeous muffins! That sugary crust looks divine. Dude. I'm GAGGING! But the muffins...those are a different story. YUM! What a funny post... nope, I never did see anyone knock back a shot of melted butter. The thought is too icky to imagine! On to those wonderful biscuits - you might be interested in making them yourself. I posted a recipe for mini ones, but you could certainly make them bigger if you like. They are totally addictive! I am the type of person who after watching someone down butter could probably never do it! Those muffins look delicious I love the sparkly sugar on the top! Hot buttered rum, the one time I drank it, was wonderful. I was a kid, and my grandfather wanted me to sleep. Sweet, warming, relaxing. Those muffins are totally tempting! I want to make them this weekend! What can I substitute for butter rum flavoring? Butter rum lifesavers are still my very favorite flavor. The muffins are calling my name... can I have one or three? I have to agree that butter rum lifesavers are my favorite lifesaver. We got those lifesaver books for Christmas every year too. The muffins look delicious. However bad watching someone knock back a shot of butter may be... it pales in comparison to watching someone chew down a stick of the stuff. I've never seen someone take a shot of butter bottom's up! Wow, that's courage, lol! (I completely know what you mean about RL's cheese biscuits! After a few of those, who needs an entree?!) I've never had hot buttered rum, but I do love the lifesavor flavor. Your muffins look fantastic, especially with that delicicous sugar crust! I love both the names for these muffins. Melted butter shots does sound disgusting. I like my butter modestly covered in flour and sugar, thank you very much. Both of my girls would totally guzzle butter if they could get away with it. Nasty! 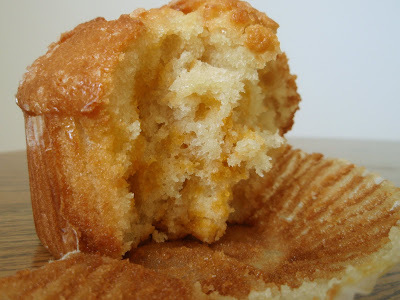 Mmm butter rum flavouring in a muffin sounds SO good!! Not that I don't slather butter generously on things, but downing a shot of it on its own does sound disgusting. I've never tried hot buttered rum but really want to. It sounds so interesting and I imagine it's balanced out by the other things in the drink. haha, I am totally a butter eater. I might do a butter shot too, but I'd probably rather sip and savor the melty, buttery, goodness. Oddly, I really don't like the butter rum lifesavers. Just something a little cloying in them. I love the dome and sugar on your muffin. Crackly, butter goodness - sure looking good. I used to work at Disneyland when I first got into college and we had some down time between parades. Out of boredom, I dared one of my co-workers to eat 10 pats of butter and he did! I don't know what's worse, gulping down melted butter or chewing on the chilled version? I like butter too but not on its own! Ewww, I never saw anyone take a shot of butter, but I remember when I was in grad school we all got together to make the foods that one or more of us had never had--artichokes, escargots, crab, lobster, all the things you dip in garlic butter (or anyway we did back then...). I was sick for a week afterwards--too much butter. And I smelled like garlic too. Phew. Thanks for the memory. This muffin, on the other hand, looks like it would be divine! But I imagine these muffins would be way better than that! Mmm, butter! Those look delicious. red lobster LOL! we had a reb lobster on cape cod, of all places. it did horribly here and closed within 3 months. Wow a shot of butter...that's gotta be good for ya. Now these muffins look awesome! I should try to find some of this butter rum flavor. Yum! I think Lon can eat a chunk of butter, no blinking, but I'm with you, kinda gross. The muffins though, those look good. One of my childhood friends use to eat butter her mum would cut butter up into little cubes and give it to her I think that may be child abuse. These muffins loook great though. can imagine my teeth sinking through that yummy struesel. looking good. love the muffin! ewww i mean i love buttery bread and such but a shot of butter, blech... but the muffins look DIVINE! I always thought hot buttered rum sounded weird, too. Is the butter necessary? I need these muffins! They look so delicious! You had me at butter. These look fab! This reminds me of an episode of Paula Deen where she ate deep fried butter. I thought it was gross. Those were my most fav. live savers too!!! omg...they were so good. (and rich). I want to make these muffins and a baaaaad way!!! my sister used to snack on butter bars! hahaha! i rather like them melted as a dip to lobsters! ok, now that thought made me hungry! I would so squirm in my seat if I saw that. Yuck. I too loved butter rum Lifesavers when growing up. ANd anytime I have tried to make a dessert with rum in it- the rum flavor is WAY too subtle. It gets burned away I think. So I could see why the artificial one would work better. Having said that I do have a rum cake that is outstanding. Mostly because you pour rum and butter over the cake after baking. Hmmm. Me thinks Holiday dessert. I will keep you posted- ha. As a child, I ate butter. Seriously. As an adult, I no longer do. Anyway, these butter rum muffins are gorgeous! 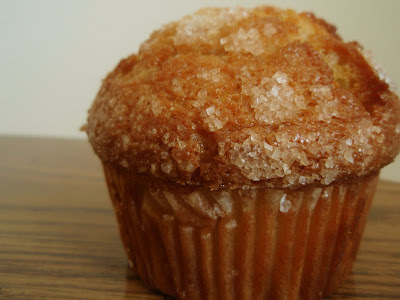 I love how the glaze and the coarse sugar gives it a crunchy (and tasty) exterior to a moist muffin. Yum! I will definitely be trying these. I've never seen anyone take a shot of butter and I hope to keep it that way! Yuck...that sounds nasty. I love butter just like the next person but that is a bit much. I never had butter rum... But the idea kind of makes me sick... but the muffins, I could! Yeah, I couldn't handle a shot of butter, but I'm pretty sure I could handle one of these! I love those lifesavers! Hot Buttered Rum is a bit strong for my taste, I make a better and creamier version using ice cream. I do like rum cake though so these muffins are perfect! a shot of butter? gah! those muffins definitely look better! Butter shots at Red Lobster? Somehow I can picture that, no problem! lol! I remember a phase as a girl when my favorite snack was a saltine smeared with a thick layer of butter. I've gotten well past that but I do still think a Butter Rum Muffin sounds grand! Have I told you before that I love your super creative and oh, so funny recipe names? I do now please pass me a muffin!